J/105 Arbitrage #116 with co-owners Bruce Stone at the helm and Nicole Breault at main/tactics won the 2018 San Francisco Bay J/Fest in the face of difficult tidal conditions. Full results are at: https://www.regattatoolbox.com/results?eventID=rsSG2XdU5M. 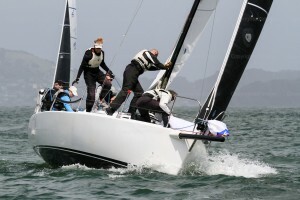 Commentary from photographer Chris Ray: "In the face of a challenging weather forecast, the St. Francis Yacht Club held its annual J/Fest with 27 J/105s competing. Rain? Low clouds, wind? Sun? Well, parts of all of the above. It all turned into a glorious weekend. The tide charts professed that we would have an ebb tide, but the starting line had strong flood currents going well into the early afternoon, making ‘local knowledge’ all the more important." In each race, around 20 of the 27 teams tried to start at the signal boat, tack to port and foot out to the late ebb in the middle of SF Bay. Those who were pinned off the line on starboard, going southerly toward the shore into more flood (even for just one minute) quickly found themselves a quarter mile behind any who escaped to the North into the westerly river, swollen by recent heavy rains. Those in the river found themselves sliding sideways, at several knots, upwind toward the starboard layline, accomplishing impressive VMG up to 9.5 knots due to both the favorable tide and the enhanced apparent wind. Despite being in some second or third row starts, Arbitrage and others were still able to tack around the signal boat, and go bow down on port, reaching out to the river and catching up to anyone in the peloton sailing their boats normally upwind on a beat. Nevertheless, there are always exceptions to the rule and in one start, Arbitrage spotted a left shift before the gun and boogied down to the tidally-unfavored pin end, starting on port and crossing the entire fleet, then footing back out to the ebb. The regatta was initially dominated by new owner Tim Russell and the talented team on NeNe who scored two bullets and two fifths, leading Arbitrage by 3 points going into the last race. However, just before arriving at the three-boat length circle around the last leeward mark, NeNe luffed Arbitrage sharply and caused a collision. After untangling themselves, both boats passed several others on the remaining two legs, with NeNe finishing that race in second and Arbitrage third while securing #1 and #2 respectively in the regatta. However, after a long evening in the protest room, NeNe was DSQ’d and Arbitrage moved up to the top spot on the podium. Ryan Simmons on Blackhawk took second, Phillip Laby on Godot third, and Ian Charles on Maverick fourth. Pictures and videos are at www.crayivp.com in the 2018 StFYC Regattas folder, J-Fest 18 gallery. Pictures by Chris Ray (www.crayivp.com), including this picture of Arbitrage.